Associate Professor Mark Bolland and colleagues at the University of Auckland, New Zealand and the University of Aberdeen, Scotland say those at high risk of vitamin D deficiency should be advised about sunlight exposure and diet and offered low dose supplements, but the rest of us should focus on eating a healthy balanced diet with food containing vitamin D and getting regular short bursts of sunshine. Vitamin D is made by the skin in response to sunlight. It helps to maintain calcium levels in the body to keep bones, teeth and muscles healthy. A lack of vitamin D can lead to bone deformities such as rickets in children, and bone pain and tenderness due a condition called osteomalacia in adults. During spring and summer, most people get enough vitamin D from sunlight on their skin and their diet. But in autumn and winter, when exposure to sunshine is minimal, the only source is from a limited range of foods such as oily fish, egg yolk, red meat, liver, fortified breakfast cereals and fat spreads. As such, Public Health England advises that everyone should consider a 10 microgram daily vitamin D supplement of during these months. Based on a comprehensive search of published evidence, Associate Professor Bolland and colleagues make the case that existing clinical trials show that vitamin D supplementation does not improve musculoskeletal outcomes, such as falls or fractures. 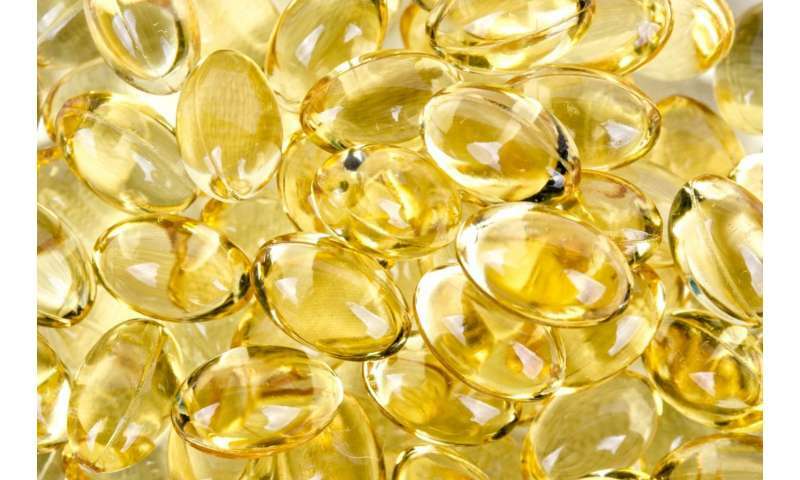 They also say there is no high quality evidence to suggest that vitamin D supplementation is beneficial for other conditions such as heart disease, stroke, and some cancers—and ongoing trial results are unlikely to alter these conclusions. If vitamin D supplementation does have benefits, they are most likely to be seen in severely deficient vitamin D populations, they write. In light of the uncertainty, they suggest people at high risk should be counselled about sunlight exposure and diet, and low dose vitamin D supplements considered on an individual basis. "Otherwise we conclude that current evidence does not support the use of vitamin D supplementation to prevent disease." In a debate article also published today, two experts discuss whether healthy people should take a vitamin D supplement during the winter months. Dr Louis Levy, head of nutrition science at Public Health England, says advice to take a vitamin D supplement of 10 micrograms a day is backed by a Scientific Advisory Committee on Nutrition (SACN) review of the evidence on musculoskeletal health outcomes. He says "Bolland and his colleagues conclude that serum 25-hydroxyvitamin D should not fall below 25 nmol/L, just like the Scientific Advisory Committee on Nutrition did earlier this year. To achieve this, PHE advice includes getting short bursts of summer sun and a balanced diet through summer and spring. But when the days are darker and shorter and sun exposure is minimal, people should consider a daily 10 microgram vitamin D supplement, as it's difficult to get enough through diet alone." He argues that taking 10 micrograms of vitamin D daily to prevent musculoskeletal ill health "is unlikely to result in harmful levels of vitamin D" and says getting enough vitamin D is particularly important "because poor musculoskeletal health remains in the top 10 causes of disability adjusted life years." But Tim Spector, Professor of genetic epidemiology at King's College London, questions whether this recommendation is evidence based. He points out that, despite hundreds of studies, "highly convincing evidence of a clear role of vitamin D does not exist for any outcome." Although vitamin D treatment still has a role in people with proved deficiency or in high risk groups, "the rest of us should avoid being 'treated' for this pseudodisease, save scarce NHS resources, and focus on having a healthy lifestyle, sunshine, and a diversity of real food." The problem is that most of these 'studies' are done with ridiculously low doses of Vitamin D.
Most studies today are done with 2000 IU per day (or an equivalent). Or, they give people a massive dose once a month and then expect this to have an impact on the body long term... D stays in the body for roughly 2 weeks, after which levels go down. The RDA was miscalculated according to peer-review on pubmed, and is supposed to be up to 10 times higher (or closer to at least 10 000 IU per day). Also, other pubmed peer-review on Vitamin D confirmed that it modulates Cathelicidin which has anti-viral, anti-bacterial and anti-microbial properties in the body.